Teachers are the most important element of the education system. Their education and qualification can therefore play a decisive role in optimizing educational processes (Cochran-Smith and Zeichner 2005; Darling-Hammond and Bransford 2005; Kennedy et al. 2008). However, review of the literature on teacher qualification and professionalization (e.g., Cochran-Smith and Zeichner 2005; Zeichner 2005) reveals that terms such as “qualification,” “professionalism,” “expertise,” and “competence” are often imprecisely defined and that their use by different authors is inconsistent. Moreover, overarching theoretical structures that would allow relevant research questions to be translated into empirically testable hypotheses are lacking. As a result, there are few empirically sound research findings to back up the abundance of theorizing on the subject or the many recommendations for practice. 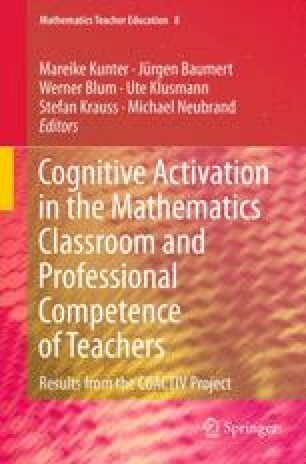 It is here that COACTIV comes in: The aim of the COACTIV research program is to make a theoretical and empirical contribution to clarifying central concepts and to furthering the discussion on the professionalization of teachers. This chapter draws on Baumert and Kunter (2006).